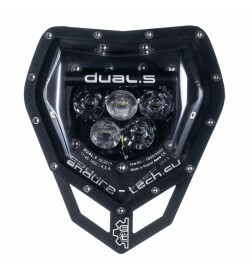 The front LED light was designed for enduro motorcycles. 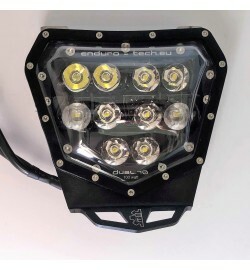 This light fits motorcycles Husqvarna TE 2015-2016. In the DUAL.5 light we have been able to generate two beams of light with different angles of incidence from one light at the same time. Thanks to this solution, we obtain diffused light (FLOOD) in LOW mode and long-range light (SPOT) in HI mode from a single DUAL.5 reflector. 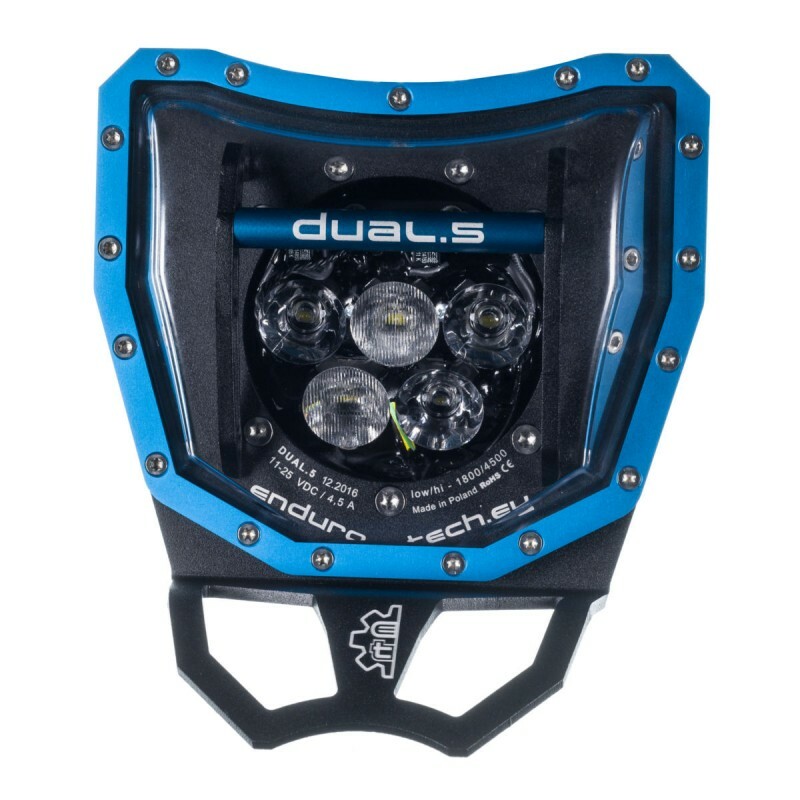 Thanks to the appropriately selected angles of incidence of light, the DUAL.5 light in the LOW - 2200 lm 22W mode lights the turns and allows driving in the fog while not dazzling the oncoming vehicles. 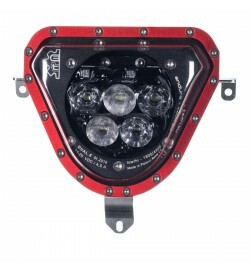 HI mode - 5500 lm 44W supports road lights of the motorcycle shining far ahead of the vehicle at the same time illuminating the corners. 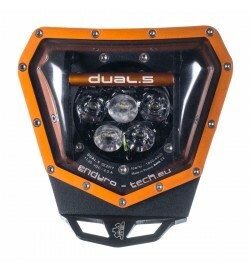 Enduro-Tech lights work well where there is a need for strong and reliable lighting in a compact and highly resistant housing. DUAL.5 is beyond the main task of supporting low and high beam at night, it also provides excellent visibility of the rider during the day. This significantly affects safety in conditions of increased traffic. 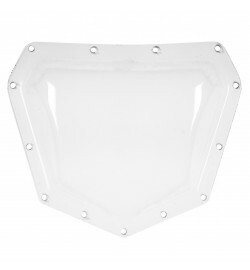 The light housing is made of PA-6 aluminum alloy. 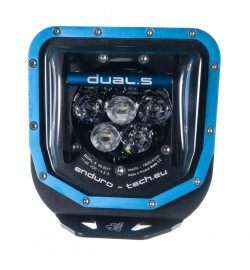 Thanks to this, the headlights are very resistant to damage and are ideal for difficult conditions. 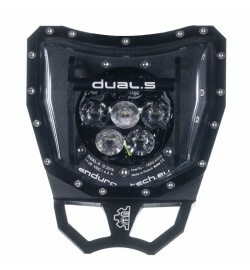 The modular design and advanced clighting system gives the possibility of easy assembly and adjustment. The construction of lights and the use of appropriate sealing systems guarantee maximum tightness. Speedbar in all models can be easily replaced. They are available in special sets. Versions - DAUL or RACE? 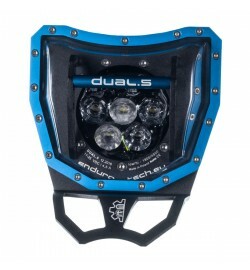 This model is available in two versions DUAL for road- and off-road motorcycles and RACE for racing and racing motorcycles.